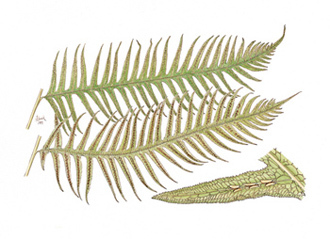 Giant Chain Fern is named both for its size and for the pattern of veins on the pinnae (leaflets). This is the largest fern of the Pacific west, and can grow to 2 meters (6 feet) in height, especially when it is an understory fern of Coast Redwood (Sequoia sempervirens) forests. If you look closely at the pinnae (leaflets), you may note that the veins come together in a chain-like pattern. A unique feature of this fern is its "trap-door" sori (tissue bearing the sporangia or spore cases). These open as if by a hinge on one side, releasing the spores when the fronds dry out. Woodwardia is a lovely addition to western gardens and is available at many nurseries.